The role of comupter-aided and structure-based design techniques in the discovery and optimization of cyclic urea inhibitors of HIV protease (C.J. Eyermann et al.). Macrocyclic inhibitors of serine proteases (M.N. Greco). Mimicking extended conformations of protease substrates: designing cyclic peptidomimetics to inhibit HIV-1 Protease (R.C. Reid, D.P. Fairlie). Peptidomimetic synthetic combinatorial libraries (B. Dörner et al.). Peptidomimetic ligands for SRC homology-2 domains (C.J. Stankovic et al.). Peptidomimetic inhibitors of farmesyl-transferase: an approach to new antitumor agents (Y. Qian et al.). Synthetic routes to lactum peptidomimetics (J. Aubé). Toward rationally designed peptidyl-prolyl isomerase inhibitors (J.P. Germanas et al.). Natural product Peptidomimetics (C.J. Barrow, P.E. Thompson). Peptidomimetics are compounds which mimic the biological activity of peptides while offering the advantages of increased bioavailability, biostability, bioefficiency, and bioselectivity against the natural biological target of the parent peptide. Examples of peptidomimetics have been isolated as natural products, synthesized as libraries from novel subunits, and designed on the basis of X-ray crystallographic studies and through an intricate knowledge of the biological mode of action of natural peptides. They offer challenging synthetic targets and are increasingly important medicinal agents and biological probes. As a consequence, peptidomimetics embrace much of what is modern medicinal and organic chemistry. This volume highlights some recent and exciting developments in the area. 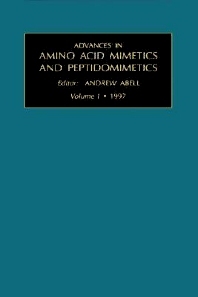 For scientists, students and researchers in the field of amino acid mimetics and peptidomimetics.